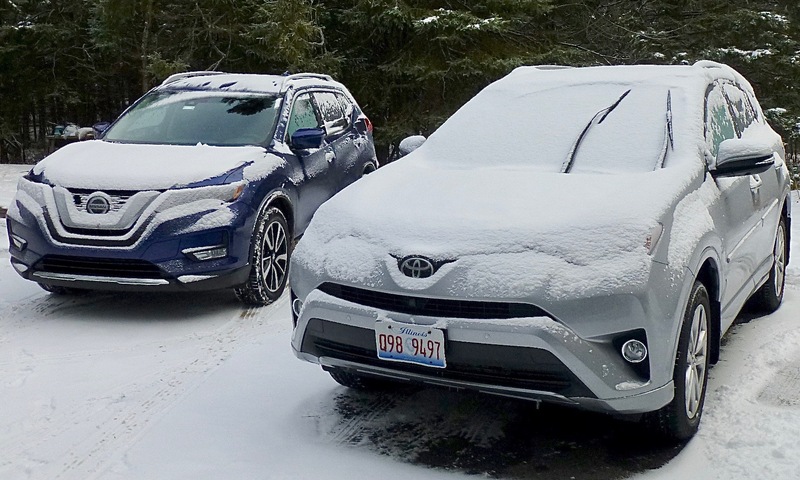 Cover them with an overnight snowfall, and the Nissan Rogue (left) and Toyota RAV4 are more similar — take your pick. Early December in Northern Minnesota, forecast called for a high reaching a surprising 40 degrees. Three days later, it plunged from 39 to a single-digit low of 6 overnight. It was 13 the next day, then the forecast said heavy snowstorm blanketing the Duluth area, but the heavy stuff split, some of it staying north and the rest veering south, along Wisconsin’s South Shore, leaving Duluth and Lake Superior’s North Shore with a mere dusting. Couple days later, we got hit with another couple inches of snow. The weather forecast can be boring, but not often in and around Duluth. It didn’t bother me, because of my luck of the test-drive draw that particular week. 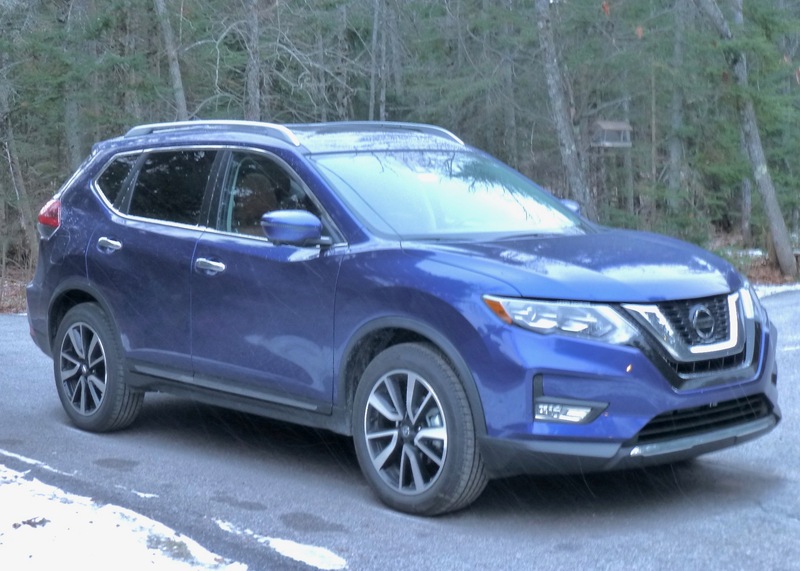 Almost as though they were related by potential, a Toyota RAV4 and a Nissan Rogue couldn’t have proven themselves more impressively. In the process, they provided a better understanding about why U.S. car-buyers are walking right past compact and midsize sedans to get to the SUVs across the showroom. Compact SUVs, often called CUVs for Crossover Utility Vehicles, have taken over. Two of the mainstays of the compact SUV trend are Toyota’s RAV4, and Nissan’s Rogue. There are dozens of others, such as the Honda CR-V, and a couple of my personal favorites in the Hyundai Tucson and the Mazda CX-5. But the RAV4 has become the largest-selling vehicle in Toyota livery, which is astounding because of the popularity of the Camry, and the Rogue has much more quietly become Nissan’s largest seller. 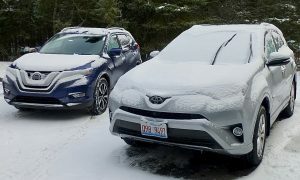 The more they advance, the more similar they seem to be, and by sheer coincidence, the week where we had the weird temperature shift from mild to numbing cold to snow, I happened to be able to switch back and forth between a 2017 RAV4 and a 2018 Rogue. Mother Nature didn’t stand a chance. 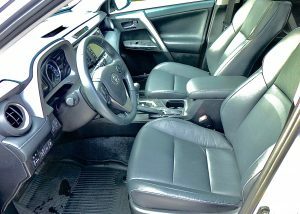 You are not likely to change a Toyota buyer over to a Nissan, nor will you convince a Nissan buyer to switch allegiance. Same goes for Honda, Mazda and now even Hyundai buyers, as well as several others. But there aren’t a lot of major letdowns in the highly competitive group. The Rogue has gotten a few upgrades for the 2018 model year, as Nissan’s top seller. 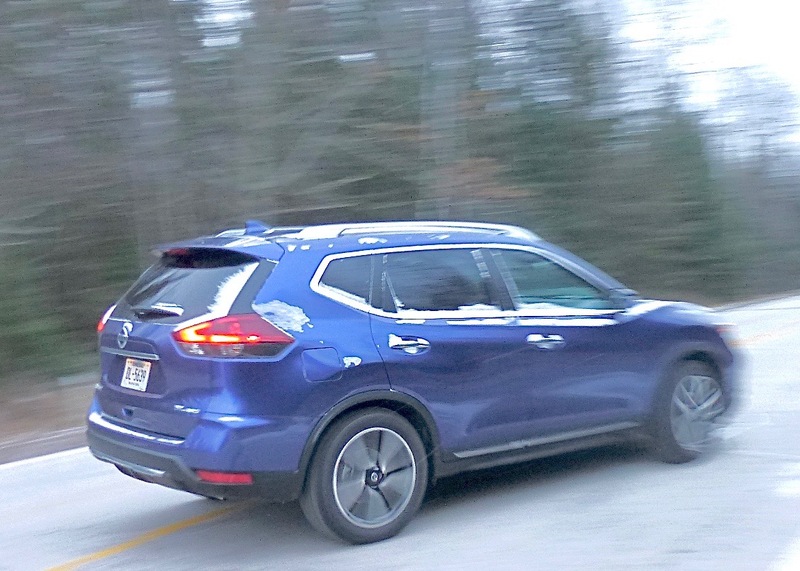 Nissan has updated its Rogue for 2018, adding some very nice creature features to the interior. Plush, red leather seats and full connectivity stuff complete the scenario, and I particularly liked the auto-start switch on the key fob, which worked easier than any others I’ve tested. Push the button from your kitchen, it starts up, and when you climb aboard you just hit the starter switch again and take off. No stop and restart. I also liked the CD player, while most companies are leaving those out. You can even get a very small third-row seat arrangement, which probably will remain folded down flat for stowage throughout their life spans. Style and function send the Rogue into battle against winter elements. Handling is firm and precise, and you always have the feeling that the Rogue is solid and firmly in command of all roadway problems. You can get Rogues for a base price of about $24,000 while the test vehicle, an SL AWD model, starts at over $26,000 and moves upward. The choice of engines is simple. You can get a hybrid model, but the standard 2.5-liter 4-cylinder has 170 horsepower and 175 foot-pounds of torque, feeding its pep through a continuously variable transmission (CVT). RAV4 continues as a Toyota mainstay, although renovation is coming. Toyota is reportedly ready to redesign its RAV4, maybe within the coming year, although it looks sleeker and better than ever in 2017 form. Toyota also is in the process of renovating all its engines, with the new Camry the only early beneficiary of the first of those. 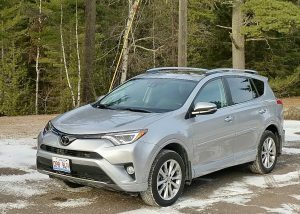 The existing RAV4 is powered by a 2.5-liter 4-cylinder with 176 horsepower and 172 foot-pounds of torque. That means its power output is so close to the Rogue that we might as well consider them identical in power. Constant refinement makes the 2017 RAV4 more modern than boxy. Everybody in my family tried out both vehicles, both as drivers and passengers, and reported back favorably. There was a split decision about which one felt more potent for traffic power, both with their CVTs. My personal opinion is that the Rogue feels a little huskier and perhaps sportier, while the RAV4 feels more compliant, a little softer riding — which can be a good thing for families — and both vehicles had safe, secure steering response. The prices also remain as close as their power output. The RAV4 was the Platinum AWD model, with a total sticker tab of $37,767. The Rogue SL AWD started at $26,070, but increased smartly with all the added lane departure warning and prevention, so both probably wind up within a hundred or so of each other. Rogue’s seats had flashier color, good seat support. The Rogue’s 2.5 engine is viewed more favorably by the EPA, which estimates city gas mileage of 25 and highway 32 miles per gallon. 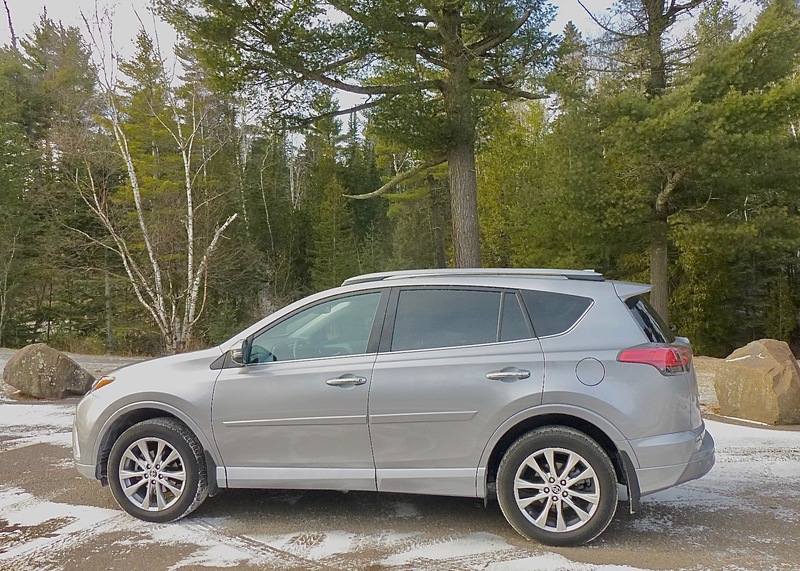 The RAV4’s 2.5 shows 22 city and 28 highway. Both vehicles were bristling with the latest safety and technology features. One of my favorite items I first witnessed from Nissan a decade ago is the bird’s-eye view of your vehicle to assure nobody is close enough to bump in any direction. Other companies have incorporated their versions of that feature, and, sure enough, the RAV4 also has it now. So both nav screens give you a split with one showing the overhead shot. 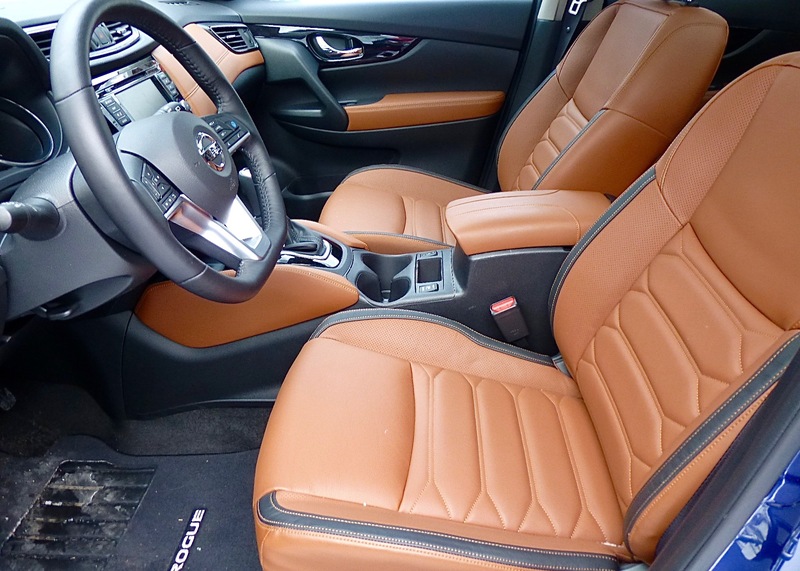 RAV4 seating has comfortable leather seats with improved bolstering. Both also had heated steering wheels, and automatic headlights, which are smarter, more alert, and quicker than humans at dimming and brightening your headlights in traffic. I also noticed that the Rogue had a row of switch controls down on the lower left of the dash, including a lock-in all-wheel-drive switch. Seems to be a strange place for it, because you could never find it at night in a storm if you needed it. On the other hand, I drove the Rogue through the nastiest part of our snowstorm, and it worked just fine. Maybe it’s always AWD but you can lock the two axles in 4×4 with the switch. Whatever, it worked fine in slippery conditions. And so did the RAV4. My suggestion is to pick whichever you prefer, and you won’t make a mistake. You also could go find a Mazda, Honda or Hyundai dealer and check their fleets out, too.